Making Kimchi has been on my culinary bucket list for years. (Everyone has that list, right?) 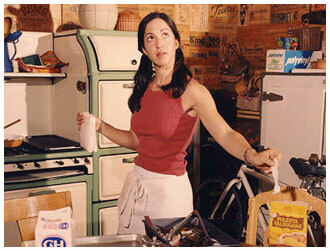 I think it’s definitely something many of us think of as a daunting task — at least I did. 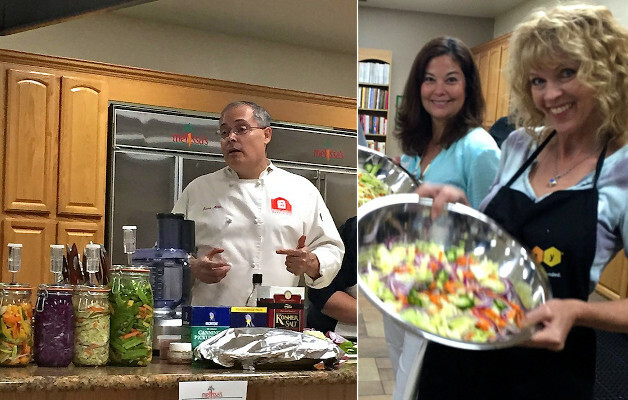 So I was thrilled with Melissa’s Produce invited me to be a part of Chef Ernest Miller’s food preserving class. Chef Miller — sometimes referred to as the Huell Howser of California food — is also a historian, educator, consultant and speaker — he not only teaches in kitchens, but also in museums and schools. Where does Kimchi come in? Well Chef Miller is the lead instructor for the Master Food Preservers of Los Angeles County and the founder of Rancho La Merced Provisions, through which he invented the best fermentation kit on the market — the Air-Lock Lacto-Fermentation Kit. You really need a kit like this to make Kimchi and other fermented foods properly at home. There’s a whole lot of science to this — in fact, I felt like I was in a lab of some sort while we were preparing the Kimchi. Kimchi is the national dish of Korea and it refers to a variety of pickled vegetables which are typically consumed daily, at almost every meal. This was originally a way to preserve vegetables for the winter months, and the average Korean consumes nearly 40-pounds of kimchi per year. Fermented foods are healthier than raw foods. Kimchi and other fermented foods are probiotic foods. They contain Lactobacillus, which is the same bacteria used to make yogurt, and is valued for its ability to aid in digestion and keep a healthy balance of bacteria in our systems. Only 3 ingredients are needed for fermentation of vegetables; water, salt and the vegetables. Some people say “everything is better with butter,” (I agree with that on some level) — but, my newest culinary saying is that “everything is better with Kimchi!” You’ll get it when you see my Grilled Sirloin Steak-Kimchi Sandwich and Kimchi Egg Ramen next week. Thank you to Melissa’s Produce for another amazing event. Robert Schueller, this was one of the best — so educational and so much fun! If you’ve never fermented foods before, I think you’ll be amazed at just how easy it can be. Below is Chef Miller’s recipe. This is not a sponsored post. I’m a huge Melissa’s Produce fan and have working with them for a few years now, and I was given the Air-Lock Lacto-Fermentation Kit from Chef Miller to try it out. Mix all ingredients thoroughly and pack firmly into your clean jar. Be sure the jar is filled to the "max" line but no higher. Place our clean notched weighting jar on the kimchi. This weight is to force water out of the kimchi and keep the kimchi submerged under the brine. Seal your jar, gently twist the airlock into place and fill with brine or distilled vinegar to the fill line. Store at 70 - 80 degrees F. Kimchi will be fully fermented in about 1-2 weeks. At 60-65 degrees F, fermentation may take 3-4 weeks. At temperatures lower than 60 degrees F, the Kimchi may not ferment. Above 80 degrees F, it may become too soft. 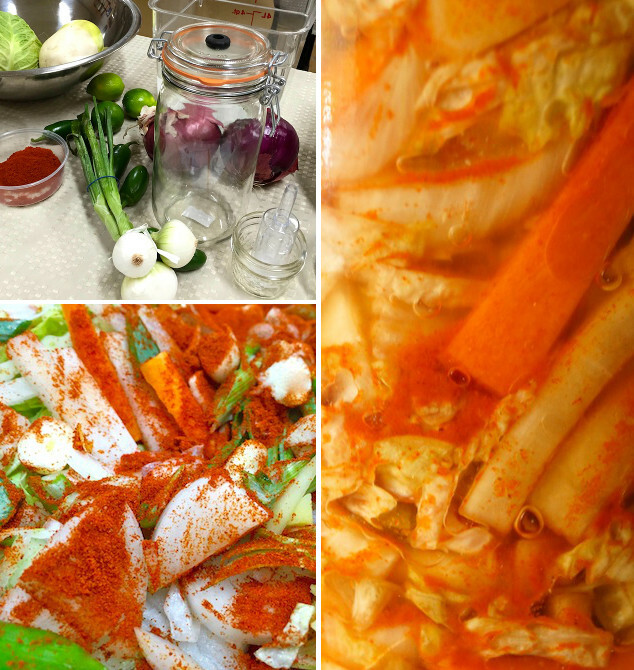 Fully fermented Kimchi can be kept in the refrigerator, tightly covered for several months. My new obsession is fermented vegetables after returning from Copenhagen, they seemed to be on everything. I was looking for a recipe with process and your post magically appeared thanks so much for all this great information. Can’t wait to dive in. Thanks so much. Good idea showing how the kimchi looked after a week! I was just thinking about making kimchi and sauerkraut and your email popped in about kimchi. I will definitely be trying this one out. Thanks! Kimchi is fabled to be one of those superfoods. I love that your recipe doesn’t have fish sauce as sometimes it dominates the flavour. I should make a jar! Your kimchi looks spicyyy! What a fun day we had :)) Thanks for the link love – I’ll add you to the links on my post, too. I am afraid kimchi is going to be one of those great culinary treats that I will never get to try (dang that garlic allergy!). I guess I could make it myself, but not sure I want to invest in a fermentor! Looks like you had loads of fun together – that would be the fun part!